For many products, a crucial point of importance is whether or not it moves, how it moves, what brings it to move, and what it takes to stop the movement. When you think about the movement or mobility of something, you likely first think “Does it have wheels?” and visualize a car. But cars, for example, only offer 2 directions of movement: forward and backward. It is the tire rods that move the wheels and offer increased degrees of movement. What about items that have a full range of mobility, like shopping carts, dollies, skateboards, and likely the office chair you are sitting in right now? Each of those items gets its movement functionality, in some way, from ball bearings. Ball bearings present an immediate benefit to any product they are introduced to. Not only do they offer initial mobility to products that would otherwise be left stationary, but – depending on the bearing (and caster) type – they can offer up to 360 degrees of rotational movement. That is what they can do, but how? Let’s take a look at how ball bearings work and how they are made. Depending on the environment the ball bearing is expected to be used in can dictate whether a shield would be used and what kind. Its purpose is to help maintain lubrication for the bearing while keeping out any contamination(s). Similar to a shield, the seal provides some added security when it comes to external elements entering the bearing. You would usually go with no seal when the bearing is going to be lubricated externally. The ball bearing retainer or separator does just what its name suggests, and separates the balls within the bearing. The importance here is that it ensures the balls stay an equal distance apart and keep a constant rotation. The main component of a ball bearing, the balls themselves. How many balls are present in a bearing depends on a number of factors such as style and size, but are there to ensure the un-pivoted movement of the bearing itself. In order to make sure the balls hold their rotation, there are 2 sets of races in the bearing. The inner race is a small one found at the center of the bearing. It has a track the runs along its outside surface that the balls roll against. Similar to the inner race, the outer race is a larger race that all other pieces sit within. The outer race has tracks that run along its insider surface that keeps the balls in rotation. 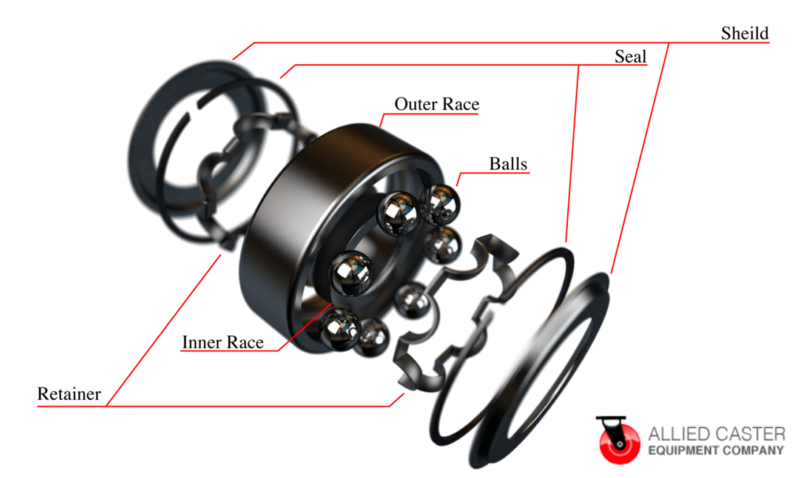 A ball bearing works when, with the assistance of lubrication, the enclosed balls experience a state of continuous motion. They keep their consistent rotation due to the retainer that keeps the balls an equal distance apart and secured within the bearing while allowing them to still spin freely. The tracks that are found on the inner and outer races are what allow for 360-degree movement and give the balls a surface to roll along. The image to the right shows an assembled bearing (with no seal). Once you have a successfully assembled ball bearing, the uses, opportunities, and applications are endless. 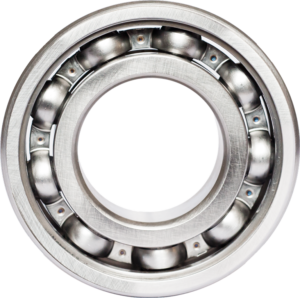 Power tools, skateboards, vehicles, medical equipment, and casters are just a few of the items that benefit from the use of ball bearings. Looking for more information on ball bearings or what type you might need for your caster order? Contact us today to speak to one of our industry experts.